The complex interactions between human and physical systems confronting social scientists and policymakers pose unique conceptual, methodological, and practical complications when `doing research'. Graduate students in a broad range of related fields need to learn how to tackle the discipline-specific issues of space, place, and scale as they propose and perform research in the spatial sciences. This practical textbook and overview blends plenty of concrete examples of spatial research and case studies to familiarize readers with the research process as it demystifies and exemplifies how to really do it. The appendix contains both completed and in-progress proposals for MA and PhD theses and dissertations. 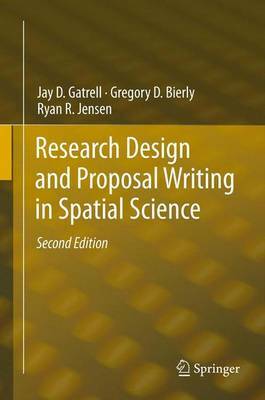 Emphasizing research as a learning and experiential process while providing students with the encouragement and skills needed for success in proposal writing, "Research Design and Proposal Writing in Spatial Science" can serve as a textbook for graduate-level research-design courses, as well as for undergraduate-level project-based spatial science courses.